Editor’s Note – Correspondent Josh Mansfield is the current coach of Tulane University. Earlier this month, the USQ Cup 11 at-large college bids were awarded. The 64 college teams competing in this year’s tournament will be the most American* college teams competing in any version of the 11 national USQ tournaments to date. As I wrote in this piece’s companion article, that expansion comes with its share of growing pains and will result in this tournament having a more diluted pool of talent than any previous Cup**. 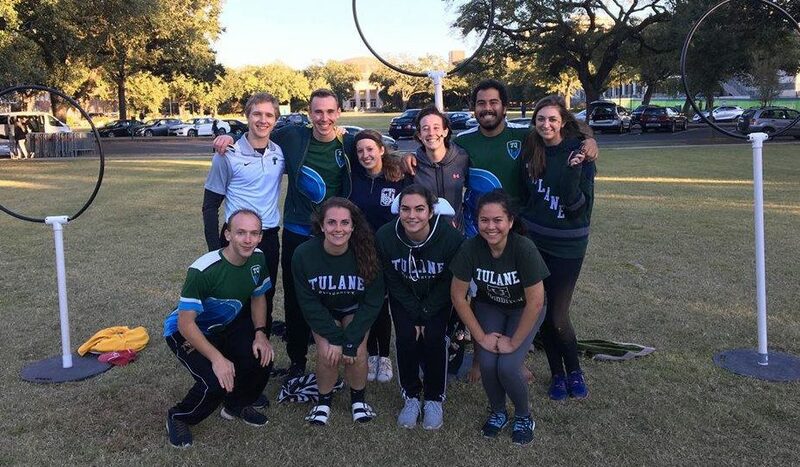 After 12 teams deferred an at-large bid, Tulane University, ranked #110 in USQ rankings, received the last bid to Nationals, making it the lowest ranked team to ever attend. Furthermore, this year’s mean Elo rating of a team competing at the college side of USQ Cup 11 is 1544, the lowest in Cup history. These facts seem to paint a fairly grim picture of this year’s Nationals, but is the picture as bleak as it seems? For years, a clear trend has arisen in the number of first-time college programs that attend Nationals. At World Cup 5, 24 new college teams attended. At World Cups 6 and 7, 17 new teams attended each year. At World Cup 8, that number dropped to nine; and at USQ Cup 9, only three new college teams showed up. Last year, alarms were raised when only one college team, UC Irvine (Anteater Quidditch), made their national debut. This year, that trend hasn’t only been turned around – it’s been turned on its head. Twelve college teams will be making their Nationals debut in Round Rock: Brandeis University, University of Central Florida, Creighton University, DeathRow Quidditch, Duke University, James Madison University, San Marcos Sharknados, SIUE, Sun Devil Quidditch, Tulane, University of Northern Colorado and West Virginia University. Skeptics may argue, and justifiably so, that USQ’s expansion of the tournament’s size merely loosens the standards of the tournament, and that any of the teams given at-large bids have as much of a chance of winning Nationals as any 16-seed has of winning March Madness—and they would be more or less correct. That said, for any team on that bubble, Nationals has always been about more than just their record at the tournament. For a team on the bubble, a trip to Nationals is an opportunity to hype the team and double down on fundraising—building skills and energy that will stay with the team for years to come. It’s a claim they can use to recruit the next season and turn a visit one year to a contendership the next. Since 2013, the farthest any first-year team has gone in a National’s bracket is the quarterfinals, and even then it’s only happened twice—Northern Arizona University in 2013 and Boise State University in 2016. When you expand that to the Sweet 16, those two are only joined by the University of Arkansas’s 2013 performance. First-year teams tend to have a shaky run at their first Cup—but the experience brought by them can be invaluable to a program. Furthermore, due to the fact that USQ Cup 11 will be run in a Swiss system, the amount of teams participating will have little impact on the level of competitiveness throughout the tournament. While each flight’s first-round games will likely end in lopsided results for the low-seeded teams, their games will only become more competitive from there, as their record begins to dictate the quality of teams they play. Logistical concerns that arise from the expansion of the tournament certainly still pose questions, most notably in the required field space, referee and volunteer resources. It is obvious that the Round Rock Multipurpose Complex will have ample space required for the event, offering 12 pitches for games, but it is hard to know how many other bid locations could have been feasible had the number of teams (and thus pitch requirements) been reduced. The additional games brought by this expansion of teams also brings a heavier burden on the amount of referee staffing that must be accounted for—most notably, head-referee staffing. Interestingly, looking only at head referees, the decision to expand the tournament seems to have been the right one, at least on paper. Nine referees are affiliated with the 16 college teams that received at-large bids. Proportionally, this is significantly higher than the 21 referees affiliated with the 48 college teams who received a regional bid (56 percent vs. 44 percent, respectively) and could help alleviate some burden placed on club-team referees (40 from 24 teams). Within context, however, it is likely that some of those referees on the at-large teams would have participated in the event as non-playing referees, and so the addition of these 16 teams is likely more or less a wash, in terms of referee staffing. Lastly, it’s hard to say exactly how many volunteers will be required due to the expansion of the field of teams. Likely, the largest constraint on volunteer logistics will be the decision to make the college tournament Swiss, rather than the number of teams attending. The Swiss format will mean most volunteers will need to be scheduled on the fly, requiring intense preparation by tournament staff to prepare for that burden. It is clear, however, that the larger amount of teams can only exacerbate those strains. In totality, it’s hard to say if the expansion of Nationals will be a net positive or negative. The logistical constraints will almost certainly be more difficult, but only time will tell if that burden will be worthwhile. For the 12 teams attending Nationals for their first time, the trip will almost certainly be a boon for team motivation. Not to mention, for many of those players, this tournament will also be the first time they’ve seen teams play from outside their region. As anyone who has attended a national tournament can attest to, the atmosphere at these tournaments is infectious—especially for first-timers. College teams still provide the major recruiting and motivating tools for the sport, and it’s hard to argue that bringing more of them to USQ Cup 11 is a mistake. All things told, the value of the decision to expand the tournament will only be clear in retrospect—when we can balance the logistical success or failure against the benefits additional teams take away from the tournament. While any failures of the tournament may be immediately clear, the benefits that come from the expanded format may trickle down to teams for months and years to come. *World Cup VII featured 67 college teams, but five were from Canada and one was from Australia. **In fact, the three lowest Elo-rated teams to ever attend a Nationals are attending this year: DeathRow Quidditch (1247), Tulane University (1245) and Sun Devil Quidditch (1203).